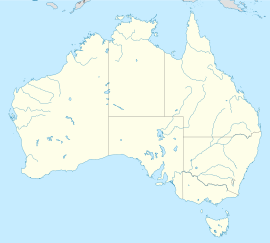 This article is about the metropolitan area in Australia. For the local government area, see City of Wollongong. 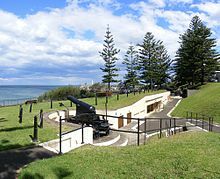 Wollongong (/ˈwʊlənɡɒŋ/ WUUL-ən-gong), informally referred to as "The Gong", is a seaside city located in the Illawarra region of New South Wales, Australia. 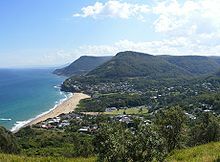 Wollongong lies on the narrow coastal strip between the Illawarra Escarpment and the Pacific Ocean, 68 kilometres (51 miles) south of central Sydney. Wollongong had an estimated urban population of 299,203 at June 2017, making it the third-largest city in New South Wales after Sydney and Newcastle, and the tenth-largest city in Australia. The city's current Lord Mayor is Gordon Bradbery AM who was elected in 2018. The Wollongong metropolitan area extends from Helensburgh in the north to Shell Cove in the south. It sits within the Wollongong Statistical District, which covers the local authority areas of Wollongong, Shellharbour and Kiama, extending from the town of Helensburgh in the north, to Gerroa in the south Geologically, the city is located in the south-eastern part of the Sydney basin, which extends from Newcastle to Nowra. Wollongong is noted for its heavy industry, its port activity and the quality of its physical setting, occupying a narrow coastal plain between an almost continuous chain of surf beaches and the cliffline of the rainforest-covered Illawarra escarpment. 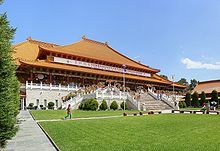 It has two cathedrals, churches of many denominations and the Nan Tien Temple, the largest Buddhist temple in the southern hemisphere. Wollongong has a long history of coal mining and industry. The city attracts many tourists each year, and is a regional centre for the South Coast fishing industry. The University of Wollongong has around 37,000 students and is internationally recognised. The name "Wollongong" is believed to mean "seas of the South" in the local Aboriginal language, Tharawal, referring to NSW's Southern Coast. Other meanings have been suggested, such as "great feast of fish", "hard ground near water", "song of the sea", "sound of the waves", "many snakes" and "five islands". Wollongong N.S.W. 1887; Aerial view of Wollongong Harbour. From the "Illustrated Sydney News" of 15 October 1887. The area was originally inhabited by the Dharawal (or Turuwal) Indigenous Australians. The first Europeans to visit the area were the navigators George Bass and Matthew Flinders, who landed at Lake Illawarra in 1796. The first settlers in the region were cedar cutters in the early nineteenth century, followed by graziers in 1812. Charles Throsby established a stockman's hut in the area in 1815. The first land grants were made in 1816. In 1830, a military barracks was constructed near the harbour. Further settlers arrived and in 1834 a town was planned. On 26 November 1834, the town was first gazetted and George Brown erected the first court house. The main road down the Escarpment through Bulli Pass was built by convict labour in 1835-6, although other passes were built during the 19th century as well, such as O'Briens Road and Rixons Pass. By 1856 Wollongong had a population of 864. In 1858, a court house was built. In 1861, a horse-drawn tramway from Mount Keira to the harbour was completed. In 1862 a telegraph line was opened between Wollongong and Bellambi. In 1865, the first gas supply in Wollongong was provided from a gas plant in Corrimal Street. In 1868 the extensions to the harbour were opened by Lady Belmore and named Belmore Basin. Patrick Lahiff established a coke works at Wollongong Harbour in the 1870s. He erected two beehive coke ovens between the north eastern end of the basin and Pulpit Rock. The ovens were demolished in 1892. The remains of the coke ovens were uncovered and recovered and are now preserved beneath the hill, with a plaque explaining their history. In 1871, the old lighthouse was completed. In 1880, steam locomotives were introduced to haul coal loads from Mount Keira mine to the harbour. Gas street lighting was introduced in 1883. In 1885, a new court house was erected in Market Street. Like many Australian court houses, it was designed in a Classical Revival style considered appropriate for public buildings. It is now listed on the Register of the National Estate. In 1886 the first town hall was erected. The Illawarra Railway to Wollongong was completed in 1887, and now continues as far south as the town of Bomaderry on the Shoalhaven River. The navigator George Bass first documented the Illawarra coal deposits in 1797. There have been many coalmines in the district. Australia's worst coal mining disaster occurred in 1902, at the Mount Kembla mine when an explosion killed 94 men and boys, the youngest aged 14, the oldest 69. Two other men died attempting to rescue survivors. In 1908 the Wollongong District Hospital was established on Garden Hill. In 1916 the Wollongong High School was opened. Heavy industry was attracted to the region by the ready availability of coal. In 1928, Hoskins, later Australian Iron & Steel, started a steelworks at Port Kembla, a few kilometres south of Wollongong. The former Broken Hill Proprietary Company (now BHP after merging with Billiton plc) acquired AI&S in 1935, but has since spun-out their steel division as a separate company, now known as BlueScope. The steelworks has grown to become a world-class flat rolled steel producer, operating as a fully integrated steel plant with a production of around 5 million tonnes per year. Other industries to have set up in the massive Port Kembla industrial complex—the largest single concentration of heavy industry in Australia—include a fertiliser plant, an electrolytic copper smelter, a locomotive workshop, a coal export shipping terminal, a grain export shipping terminal and an industrial gases manufacturing plant. In 1936, the new Wollongong Lighthouse was finished on Flagstaff Point. In 1942 Wollongong was proclaimed a City. In 1947 City of Greater Wollongong was formed. In 1954 the population of Wollongong was 90,852. In 1956 new Wollongong City Council Chambers were opened. In 1961 the Wollongong University College was established. In 1963, the Wollongong Teachers College was established. In 1965 the Westfield shopping centre at Figtree opened. In 1985, the railway line was electrified to Wollongong, and in 1993 to Dapto. In 1986 the Wollongong Mall was completed. For a short while, trams (trackless trains) were used in the mall, though this ceased due to dangers involved. The mall was re-opened to traffic after the initial test but re-zoned a pedestrian area after and has remained one since. In 1987 the council chambers and library building were completed, replacing the old council building at the present art gallery site. The Crown Gateway Shopping Centre was completed. Wollongong Mall was opened. In 1988, the current council administration building was completed, as well as the Illawarra Performing Arts Centre (IPAC), across the road on Burelli Street. IPAC was officially opened by Prince Charles and Princess Diana in 1988. A sculpture recognising Lawrence Hargrave was placed via \ helicopter on the eastern foothills of Mount Keira. In 1998 the 6000 seat Wollongong Entertainment Centre was opened. In 1999, the Gateway and Crown Central mall buildings were unified as Wollongong Central and a pedestrian walkway/café was built connecting the buildings in an above ground bridge. In 2000, as part of the Sydney Olympics, the Olympic torch was carried through Wollongong as part of its journey. In 2001, the population of Wollongong reached 181,612 people. In 2004 the Wollongong City Gallery celebrated its 25th anniversary. In 2005 Qantas established a daily air service from Wollongong to Melbourne that lasted till 2008. In 2006/2007, the library was renovated, including new facilities, as part of the tenth anniversary of the library's current site. Also at this time the beachfront was renovated with a new lookout and walkway upgrade. In June 2007, erosion was caused via storms to the beaches, the worst in 30 years. Despite the decline of traditional manufacturing and blue-collar industries due to the abandonment of protectionist economic policies in the 1980s, many of these industrial installations still exist. The city's economy is, however, on the rebound, thanks to diversification of economic activity including higher education, the fine arts, tourism, residential construction and eco-friendly electricity generation; however, the city's economy still relies primarily on heavy industry, and will continue to in the near future. The city of Wollongong has a distinct geography. It lies on a narrow coastal plain flanked by the Tasman Sea to the east and a steep sandstone precipice known as the Illawarra Escarpment to the west. The coastal plain is widest in the south and narrowest in the north, with the city centre located about midway. South of the city centre but within the urban area is Lake Illawarra, a large lagoon. The escarpment ranges between 150 and 750 metres (490–2,460 ft) above sea level, with locally famous mountains such as Mount Keira (464m), Mount Kembla (534m), Broker's Nose (440m) and Mount Murray (768m) to the south. It contains strata of coal measures, and the adit entrances to many coal mines have been established along the slopes of the escarpment throughout Wollongong. Suburbia encroaches on the escarpment's lower slopes in some areas, but the majority remains in a relatively natural state forested with dry sclerophyll and pockets of temperate rainforest. The escarpment is largely protected by a State Conservation Area and local scenic protection zoning, and provides the visual backdrop to the city. In the north the escarpment meets the coastline, and north of this the coastal road Lawrence Hargrave Drive hugs the cliff line. The unstable geology of the escarpment resulted in rockfalls, forcing the closure of the road. Subsequently, part of Lawrence Hargrave Drive was replaced in 2005 by the Sea Cliff Bridge just off the coast, crossing the submerged rock shelf. The bridge carries both vehicular and pedestrian traffic. The Illawarra railway line must go through several tunnels to reach the Sydney metropolitan area. The Southern Freeway and Princes Highway provide alternative inland routes, descending the escarpment further south at Bulli Pass or at Mount Ousley, entering just north of Wollongong's city centre. To the south the plain reaches its maximum extent around Albion Park where it incorporates a large coastal saltwater lagoon called Lake Illawarra, separated from the Pacific Ocean by a long sandy spit. Lookout from the Illawarra escarpment above Wombarra over the northern Illawarra plain viewing Austinmer, Thirroul, Bulli, Wollongong up to Port Kembla in the far distance. The coastal strip consists of highly fertile alluvium, which made Wollongong so attractive to agriculturists in the nineteenth century. It contains many hills including the foothills of the escarpment's lower slopes, and while these generally do not exceed one hundred metres in height they give much of the city an undulating character. The coastal strip is traversed by several short but flood-prone and fast-flowing streams and creeks such as Para Creek, Allans Creek, Nostaw Ravine, Jimbob Creek, Mullet Creek and Macquarie Rivulet. The coastline consists of many beaches characterised by fine pale gold-coloured sands; however, these beaches are sometimes interrupted by prominent and rocky headlands, such as Tego Rock, jutting into the sea. In places these headlands have been excavated or extended to create artificial harbours at Wollongong, Port Kembla, Shellharbour and Kiama. Just off the coast south of Wollongong centre, near Port Kembla, lies a group of five islands known collectively as The Five Islands. The islands are a wildlife refuge. The inner city area includes the suburbs of Wollongong and North Wollongong, extending from Para Creek in the north, west to include the Wollongong Hospital, and south to the Greenhouse Park. At the 2016 census, the suburb of Wollongong had a population of 18,442. Wollongong Central's West Keira building. The CBD is a major commercial hub containing many department stores and specialty shops, offices, and entertainment venues. It is centred on the Crown Street Mall and Wollongong Central, and approximates the area bounded by Market, Corrimal, and Burelli streets and the railway line. Surrounding the CBD lies a mixture of parks, reserves, light commercial property, houses and multi-story residential units. Multi-story housing is evident particularly on Smith's Hill, north-east of the CBD, reflecting the popularity of combining inner-city living, coastal views and a beachside lifestyle. Wollongong Harbour including Belmore Basin, Brighton Beach, the Breakwater Lighthouse and the Head Lighthouse. To the east of the city lies Flagstaff Point, a rocky headland with eroded low cliffs topped by a grassy hill. The northern side of the point was excavated by convict labour to form Belmore Basin. This was later extended with the northern breakwater to create Wollongong Harbour. The area is the site of a historic colonial fort, several restored cannons and two lighthouses, a feature peculiar to the east coast of Australia. The older Wollongong Breakwater Lighthouse located at the harbour entrance was made of wrought iron plates in 1871 and has become an icon of the city. 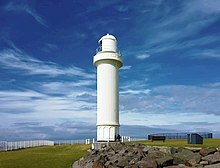 The newer Wollongong Head Lighthouse was constructed in 1936 atop the Flagstaff Hill and is still used in the early 21st century. Belmore Basin houses the commercial fishing fleet and Fisherman's Co-op, while the main harbour shelters private vessels. The main beaches of central Wollongong are North Wollongong (or simply North) Beach, extending from the harbour up to the Para Creek lagoon and Puckeys Estate Reserve, and Wollongong City Beach, extending south from Flagstaff Point and into Coniston Beach. Wollongong has an oceanic climate (Köppen: Cfb), but with humid subtropical (Cfa) influences as its warmest month mean of 21.9 °C (71.4 °F) is just below the subtropical isotherm of 22 °C (72 °F). The highest recorded temperature is 44.1 °C on 1 January 2006, and the lowest 0.8 °C on 27 July 1986. Annually, Wollongong receives 107.4 clear days. Rainfall is fairly evenly distributed throughout the seasons, with a bias to the first half of the year. It is often associated with orographic lift caused by the escarpment. A significant flood event occurred on 18 August 1998 when Wollongong recorded 316 mm of rainfall (the nearby suburb of Mt Ousley recorded in excess of 445 mm), mostly falling in a 3-hour period. Wollongong also experiences thunderstorms during the warmer months bringing lightning, heavy rain and occasionally hail. July and August are known as the windy months, with westerly gales that can gust at over 100 km/h. The Wollongong metropolitan area includes the suburbs, outlying towns and rural localities stretching from Helensburgh in the north to Kiama in the south. According to the 2016 census, it had a population of 285,678 people. 74.1% of people were born in Australia. The next most common countries of birth were England 4.2%, The former Yugoslav Republic of Macedonia 1.3%, China 1.1%, Italy 1.1% and New Zealand 1.0%. 80.4% of people spoke only English at home. Other languages spoken at home included Macedonian 2.2%, Italian 1.5%, Mandarin 1.1%, Arabic 1.1% and Spanish 0.8%. The most common responses for religion were No Religion 27.2%, Catholic 26.1% and Anglican 17.9%. 4.2% of employed people worked in Hospitals (except Psychiatric Hospitals). Other major industries of employment included Aged Care Residential Services 2.6%, Higher Education 2.6%, Supermarket and Grocery Stores 2.4% and Cafes and Restaurants 2.4%. It is the third largest city in New South Wales and the tenth largest in Australia. Using 2006 ABS geography, around 89% of the statistical district's population reside in the built-up urban centre extending from Clifton to Shell Cove. The following table includes selected 2006 census figures for these areas, together with those for the central suburb of Wollongong. Wollongong is continuing to grow with a population growth of 3.1% for the period 2001 to 2006, although the supply of new residential land is limited by the geography particularly in the northern suburbs. The west Dapto area is a major centre of future growth with plans for 19,000 new dwellings and 50,000 people within 40 years. New residential areas are also being developed further south around the Albion Park, Shell Cove and Kiama areas. The Great Mercy Shrine at the Fo Guang Shan Nan Tien Temple complex. Wollongong has a distinctly multicultural population. Many migrants were attracted to the area by the job opportunities at the Port Kembla steelworks in the post-war period, and settled in surrounding suburbs such as Cringila, Warrawong and Coniston. By 1966 about 60% of the wage earners at the Australian Iron and Steel steelworks were born overseas coming from over 70 countries. These included British, Macedonians, Portuguese, Greeks, Bosnians, Croatians, Serbians, Germans, Turks, and Chileans. With the end of the White Australia policy these were followed by Indo-Chinese refugees in the 1970s, Indians, Filipinos, Chinese, Malays and Pacific Islanders in the 1980s and 1990s. The university continues to attract students and staff from all over the world, with around 5,000 overseas student enrolments. Around 20,000 people commute daily to jobs in Sydney by road and rail, making it one of the busiest commuter corridors in Australia. There are two campuses of the Illawarra Institute of TAFE. The Wollongong Campus is the network's largest campus, and it offers a variety of courses. Wollongong has one university, the University of Wollongong, which was formerly part of the University of New South Wales. The University was awarded the "Australian University of the Year" in two consecutive years (1999–2000, 2000–2001) by the Good Universities Guide, and is internationally recognised. It has two main campuses: the primary campus on Northfields Avenue, and the Innovation Campus on Squires Way. The University's Sydney Business School also has a secondary campus in Sydney. Wollongong has a number of primary and high schools, including public, denominational and independent. Specialist high schools include the selective Smith's Hill High School, the Illawarra Sports High School, The Illawarra Grammar School, St Mary Star of the Sea College (all-girls Catholic high school), Edmund Rice College (all-boys Catholic high school), Holy Spirit College (Co-educational Catholic high school), Cedars Christian College, Illawarra Christian School and the Wollongong High School of the Performing Arts. 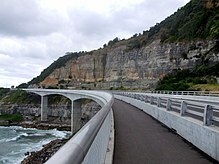 The Sea Cliff Bridge on Lawrence Hargrave Drive bypasses a dangerous section of the Illawarra Escarpment. The main road connecting Wollongong is the M1 Princes Motorway (formerly the F6). The motorway, part of National Route 1, descends the escarpment via Mount Ousley Road to enter the city near the University of Wollongong and exits at its southern fringe. A second freeway, Memorial Drive (formerly the Northern Distributor), continues northward from the university to connect Wollongong's northern suburbs, Bulli Pass and the scenic Lawrence Hargrave Drive. The Illawarra Highway connects Wollongong's southern suburbs to the Southern Highlands via Macquarie Pass. Wollongong is served by the Illawarra railway line. Passenger rail services on this line connect the centres of Nowra and Kiama to the south and Sydney to the north. A branch line connects suburbs between the CBD and Port Kembla. A passenger rail service connecting Wollongong to the Southern Highlands has since been replaced with a coach service. Wollongong railway station is the city's main train station, and serves Wollongong's CBD. Freight services connect Sydney markets with Port Kembla and the Manildra Group factory at Bomaderry. The Southern Highlands line is used primarily for freight, providing an important bypass for Sydney's congested rail network. Route services in Wollongong are provided by Premier Illawarra and Dion's Bus Service who also provide school/charter services together with some other companies. Wollongong railway station serves as the network's hub. Services connect Wollongong suburbs to Shellharbour, Lake Illawarra and the Royal National Park. There is also a Free Shuttle Bus service that connects the CBD, University and the suburbs of North Wollongong, Fairy Meadow and Gwynneville. Wollongong is serviced by Illawarra Regional Airport, also known as the Wollongong Airport. The Airport is located in Albion Park Rail, 18km south of Wollongong CBD in the Shellharbour City LGA. Regular Public Transport (RPT) air services to Melbourne (Essendon) and Brisbane airports were recommenced by Fly Corporate in 2018, following the cancellation of previous services offered by JetGo and QantasLink. Fly Corporate operates 34 seat SAAB 340B turboprop aircraft. There are multiple air charter businesses including NSW Air, EliteJet and Touchdown Helicopters. The Historical Aircraft Restoration Society (HARS) is also based at the airport. Wollongong maintains an active arts scene. In the area of music the city is home to various music and jazz ensembles. The Wollongong Conservatorium of Music provides musical tuition for instruments and voice in classical, jazz and contemporary styles. It is one of the largest regional conservatoriums in Australia and located in the historic Gleniffer Brae Manor House, part of the Wollongong Botanic Gardens. The local professional theatre company, Merrigong Theatre Company, is located at the Illawarra Performing Arts Centre. Merrigong also manages the city's key civic and community venue, the Wollongong Town Hall, and presents a diverse range of events in the heart of the city. Other local theatre groups include The Arcadians, The Phoenix Theatre and Wollongong Workshop Theatre. The annual Wollongong Eisteddfod showcases local talent in music, theatre and dance. The Wollongong City Gallery houses a significant collection of the art of the Illawarra, contemporary Australian, Aboriginal and Asian art. The popular 1990s stoner rock band Tumbleweed were formed and based in Wollongong, as are Surf-Rock duo Hockey Dad. Yours and Owls Festival is an annual music festival that attracts 12,000 people and features the best up and coming Australian and international bands. Cyrus Villanueva, winner of the seventh season of The X Factor Australia, was born and raised in Wollongong. Wollongong also hosts Wonderwalls, an annual street art festival featuring local and internationally acclaimed street artists. Entertainment venues include the Crown Street Mall, many restaurants and cafes, the town cinemas and the Illawarra Performing Arts Centre. Adjacent to WIN Stadium, the home ground of the NRL team St. George Illawarra Dragons, is the WIN Entertainment Centre: a multipurpose venue which hosts concerts and sporting events (including Southern Stars, basketball and motocross stunt shows). There are numerous city nightclubs, pubs & registered clubs; Including The Illawarra Master Builders Club, The Grand Hotel (back to its original name, after being called Cooney's for a few years), Mr Crown, Ron De Vu, The Illawarra Hotel, The Harp Hotel, and The North Wollongong Hotel. Most suburbs also have their own hotels, each with individual character. Nippers at start position before their swim at Stanwell Park beach. Wollongong has 17 seasonally-patrolled local beaches: Stanwell Park, Coalcliff, Scarborough/Wombarra, Coledale, Austinmer, Thirroul, Sandon Point, Bulli, Woonona, Bellambi, Corrimal, Towradgi, Fairy Meadow, North Wollongong, Wollongong City, Port Kembla and Windang. Surfing, rock fishing, swimming, skimboarding are common activities. The Wollongong to Thirroul Bike Track, a thirteen kilometre Heart Foundation walking/biking pathway which runs northwards adjacent to the Illawarra coastline starting at Wollongong Beach, is frequented by walkers, joggers, skaters and bicycle riders. Bushwalking on nearby Mount Keira and Mount Kembla, and motorbike riding at the Motocross Track on the escarpment west of Wollongong, are also popular activities. Wollongong has many parks. In the city centre is McCabe Park, featuring a playground, the local youth centre, a war memorial, community hall, a sculpture called "Nike" and a brick amphitheatre. Lang Park, adjacent to the city beach, has a number of shelters built in the 1950s. These were subject for demolition but were saved by a community vote. Stuart Park, to the coastal north of the city but south of Fairy Lagoon and Puckeys Estate Reserve, is well known as a landing spot for skydivers as well as a place for outdoor recreation and social gatherings. Stuart Park is also distinctive for its Norfolk Island Pines, planted during the North Wollongong tourism boom in the 1920s. J.J.Kelly Park to the south is used by circuses, as well as a protected area of creek leading to the Greenhouse Park north of the Port Kembla Steelworks, containing a revegetated area of once waste and a lookout, as well as the small remnants of Tom Thumb Lagoon, which once stretched north to Swan Street. Beaton Park in Gwynneville is home to Tennis Wollongong and the Leisure Centre with an athletics complex, indoor heated swimming pool, gymnasium and multipurpose sports hall. A rugby league match being played at Wollongong Showground, one of two home grounds used by the St. George Illawarra Dragons. The St George Illawarra Dragons Rugby league club represents the city in the National Rugby League (NRL) competition. 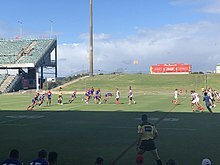 The club was formed in a merger between the St. George Dragons and the Illawarra Steelers in 1999, and continues to play some home games at WIN Stadium. They won the 2010 NRL Grand Final against the Sydney Roosters. Prior to the merger the Illawarra Steelers had represented the area in the New South Wales Rugby League premiership and NRL between 1982 and 1998. Rugby League has been played in Wollongong since 1911, and the area has produced at least 41 international players. At the local level league continues to have a strong following with a number of teams playing in the Illawarra Rugby League and Group 7 Rugby League competitions. The Illawarra Cutters represent the Illawarra region in the New South Wales Cup and the Harold Matthews Cup. The city does not have a senior cricket team representing it. Ireland captain Trent Johnston grew up in Dapto and played for New South Wales before leaving for Ireland. Australian internationals and New South Wales players Brett and Shane Lee were raised in Oak Flats and played for the local cricket club Oak Flat Rats. The Illawarra Lions represent the region in the Sydney AFL competition (as the only non-sydney base side). The Illawarriors are a rugby union club based in the Illawarra, who contest the Shute Shield NSW club competition. The club play some of their home games at WIN Stadium. Wollongong FC is the region's football (soccer) club who compete in the New South Wales Premier League. Scott Chipperfield, a Wollongong native who became a professional football player in Europe, along with Tim Cahill, has recently expressed an interest in being involved in a Wollongong football club in the A-League, as well as the Sydney club playing some promotional games in Wollongong. Great South Football is a consortium preparing the Illawarra's South Coast A-League bid. In late 2008, the club folded due to debt incurred over the past season. It is proposed that a new community-based entity will take on the Football NSW licence previously held by Wollongong FC. The Illawarra Cycling Club holds road cycle races almost every week of the year. During the summer, velodrome racing is also promoted at the Unanderra Velodrome on the Princes Highway. A recent focus within the club has seen a shift to encompass a stronger emphasis on youth development programs alongside its already strong commitment to competitive under 19's, 23's and adult road racing. The club is represented at a state and national level regularly and has had several riders compete at international levels. The Gong Scorpions are the local Floorball team from the Wollongong area. The Club plays socially at the Wollongong University and has recently been re-established in order to compete in the NSW Elite Series. Baseball has been played in the region with structured competitions conducted since 1938. The Illawarra District Baseball Association was the governing body from this year until 1991 when the Illawarra Baseball League was created. The Illawarra Junior Baseball League was inaugurated in 1984 to accommodate a growing number of juniors that peaked at around 950 players in 1995. Eight regional clubs from four Local Government Areas play in the I B L. A regional club, the Illawarra Flame Baseball Club, fielded teams in four grades in the New South Wales Baseball League Sydney Major League from 1994 to 2007. The first grade team made the Grand Final in their inaugural season. The Club won a total of four premierships while participating. The IFBC played their inaugural games against the All Kawasaki Baseball Club in August 1994 the games being the first sporting exchange between the Sister Cities, Wollongong and Kawasaki. The Wollongong Whales compete against Bondi Icebergs Winter Swimming Club, South Maroubra Dolphins Winter Swimming Club, Cronulla Polar Bears Winter Swimming Club, Maroubra Seals Winter Swimming Club, Coolangatta Surf Life Saving Club, Clovelly Eskimos Winter Swimming Club, Bronte Splashers, Coogee Penguins Winter Swimming Club and Cottesloe Crabs in the Winter Swimming Association of Australia Championships. Otis Jones is the regions superstar wrestler with an International following. Other popular sports in the Illawarra include golf, rock climbing, surfing, cup stacking, triathlon and mountain biking. In the book Quidditch Through the Ages by J. K. Rowling, the Wollongong Warriors are listed as one of Australia's quidditch teams. They have a rivalry with the Thundelarra Thunderers, and are the inventors of the Wollongong Shimmy, a high-speed zig-zag move designed to confuse and distract opposing Chasers. Wollongong Warriors is now a real club in Australian Quidditch Association, a Muggle quidditch league. Wollongong will be hosting the UCI Road World Championships in 2022. ^ "Regional Population Growth, Australia, 2016-17". ABS. Archived from the original on 26 April 2018. Retrieved 6 October 2018. ^ a b "Wollongong Statistical District Map". Australian Bureau of Statistics. Retrieved 2 January 2009. ^ "Basin gif". Dept of Primary Industries. Archived from the original on 17 September 2011. Retrieved 12 July 2011. ^ "Nan Tien Temple Home Page". Nan Tien Temple. Archived from the original on 21 March 2009. Retrieved 31 August 2008. ^ "Illawarra Facts & Figures". Tourism NSW. Archived from the original on 25 May 2009. Retrieved 2 January 2009. ^ a b "Key Statistics". University of Wollongong. Archived from the original on 17 December 2008. Retrieved 2 January 2009. ^ a b "Awards and Achievements". University of Wollongong. Archived from the original on 17 December 2008. Retrieved 2 January 2009. ^ "Place Names of Wollongong". Wollongong City Library. Archived from the original on 21 April 2008. Retrieved 8 May 2008. ^ McCarthy, F. D., The Australian Museum: New South Wales Aboriginal Place Names and Euphonious Words, with their Meanings, 3rd ed., Australian Museum, Sydney, 1959. ^ Cousins, Arthur, The Garden of New South Wales, Producers' Co-op. Distributing Society Ltd, Sydney, 1948. ^ McDonald, W. G., Earliest Illawarra: By its Explorers and Pioneers, Illawarra Historical Society, [Wollongong], 1966. ^ "The Wollongong Head Lighthouse". Archived from the original on 4 March 2016. Retrieved 15 March 2016. ^ "St. Michael's Cathedral & Rectory". New South Wales State Heritage Register. Office of Environment and Heritage. H00602. Retrieved 18 May 2018. ^ "North Beach Precinct". New South Wales State Heritage Register. Office of Environment and Heritage. H01737. Retrieved 18 May 2018. ^ "Wollongong Harbour Precinct". New South Wales State Heritage Register. Office of Environment and Heritage. H01823. Retrieved 18 May 2018. ^ "Shop". New South Wales State Heritage Register. Office of Environment and Heritage. H00467. Retrieved 18 May 2018. ^ "Wollongong East Post Office". New South Wales State Heritage Register. Office of Environment and Heritage. H01616. Retrieved 18 May 2018. ^ "Wollongong Hospital Nurses Home". New South Wales State Heritage Register. Office of Environment and Heritage. H00836. Retrieved 18 May 2018. ^ "Wollongong Railway Station Group". New South Wales State Heritage Register. Office of Environment and Heritage. H01289. Retrieved 18 May 2018. ^ "Regent Theatre". New South Wales State Heritage Register. Office of Environment and Heritage. H01735. Retrieved 18 May 2018. ^ "Little Milton". New South Wales State Heritage Register. Office of Environment and Heritage. H00272. Retrieved 18 May 2018. ^ Australian Bureau of Statistics (27 June 2017). "Wollongong (state suburb)". 2016 Census QuickStats. Retrieved 16 July 2017. ^ "Wollongong, New South Wales Köppen Climate Classification (Weatherbase)". Weatherbase. Archived from the original on 6 September 2015. Retrieved 15 February 2019. ^ a b c "Bureau of Meteorology – Summary statistics WOLLONGONG UNIVERSITY". Australian Bureau of Meteorology. Archived from the original on 29 November 2014. Retrieved 20 November 2014. ^ "SIGNIFICANT WEATHER – AUGUST 1998". Australian Bureau of Meteorology. Archived from the original on 12 February 2008. Retrieved 24 February 2008. ^ "Geography Stimulus Booklet – Wollongong Floods" (PDF). Archived from the original (PDF) on 27 June 2008. Retrieved 24 February 2008. ^ Australian Bureau of Statistics (27 June 2017). "2016 Community Profiles: Wollongong (SUA)". 2016 Census of Population and Housing. Retrieved 29 November 2018. ^ a b Australian Bureau of Statistics (25 October 2007). "Wollongong (NSW) (Statistical District)". 2006 Census QuickStats. Retrieved 7 September 2008. ^ a b Australian Bureau of Statistics (25 October 2007). "Wollongong (Urban Centre/Locality)". 2006 Census QuickStats. Retrieved 7 September 2007. ^ a b "Wollongong Urban Centre/Locatity Map". Australian Bureau of Statistics. Retrieved 7 September 2008. ^ Australian Bureau of Statistics (25 October 2007). "Wollongong (State Suburb)". 2006 Census QuickStats. Retrieved 7 September 2007. ^ "Wollongong State Suburb Map". Australian Bureau of Statistics. Retrieved 7 September 2008. ^ "West Dapto". Wollongong City Council. Archived from the original on 22 July 2008. Retrieved 16 January 2009. ^ "West Dapto Implementation". Wollongong City Council. Archived from the original on 23 July 2008. Retrieved 16 January 2009. ^ a b c d Hagan, Jim, ed. (1997). "14. The Emergence of Multicultural Wollongong". A History of Wollongong. The University of Wollongong Press. ISBN 0-86418-446-8. ^ "Regional Population Growth, Australia, 2009–10". Australian Bureau of Statistics. Australian Bureau of Statistics. Archived from the original on 4 February 2012. Retrieved 30 July 2014. ^ "Illawarra transport infrastructure priorities" (PDF). Illawarra Business Chamber. Archived from the original (PDF) on 25 February 2009. Retrieved 17 January 2009. ^ Savage, Desirée (2 October 2015). "Illawarra cheer squad backing Cyrus". Illawarra Mercury. Archived from the original on 24 November 2015. Retrieved 24 November 2015. 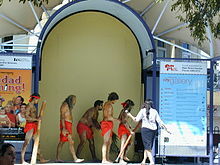 ^ "Illawarra History". St George Illawarra Dragons. Archived from the original on 27 February 2012. Retrieved 9 November 2010. ^ "AFL South Coast Seniors". Fox Sports Pulse. Archived from the original on 17 December 2013. Retrieved 17 December 2013. ^ "Venue and Season by Season results". Basketball Australia. Archived from the original on 10 November 2010. Retrieved 7 November 2010. ^ "Winter Smimming Association of Australia". Archived from the original on 4 February 2015. Retrieved 4 February 2015. ^ "Wollongong To Host 2022 UCI World Championships". Bicycling Australia. Archived from the original on 15 October 2018. Retrieved 15 October 2018. ^ "Sister cities". Wollongong City Council. 26 July 2010. Archived from the original on 17 October 2010. Retrieved 7 November 2010. Look up Wollongong in Wiktionary, the free dictionary. Wikimedia Commons has media related to Wollongong. Wikisource has the text of the 1911 Encyclopædia Britannica article Wollongong. Wikivoyage has a travel guide for Wollongong.